The Telegraph: Released in the same year as Seven Samurai, directed by a colleague of Kurosawa’s and starring one of Japan’s most famous actors, the film Gojira was a far cry from its B-movie successors. It was a sober allegory of a film with ambitions as large as its thrice-normal budget, designed to shock and horrify an adult audience. Its roster of frightening images — cities in flames, overstuffed hospitals, irradiated children — would have been all too familiar to cinemagoers for whom memories of Hiroshima and Nagasaki were still less than a decade old, while its script posed deliberately inflammatory questions about the balance of postwar power and the development of nuclear energy. Vice: In his Study of the Effects of the Atomic Bomb on Japenese Culture, John Rocco Roberto writes that "In producing Gojira, special effects master Eiji Tsuburaya, producer Tomoyuki Tanaka, and director Ishiro Honda accomplished a feat unequaled at the time. In the guise of a typical Hollywood-style "monster movie," they made Japan, and ultimately the world, experience the bombings of Hiroshima and Nagasaki all over again." And that was the explicit intention of the film. Claude Estebe, a Japanese visual culture scholar, explains the truly massive impact of the film of the time. "Japan was occupied by the US army until September, 1952. During this period there was a ban imposed by American forces on information about the Hiroshima and Nagasaki nuclear bombings and their aftermaths—namely the radioactivity-induced diseases," Estebe said in an interview. "Gojira was one of the first movies showing and remembering the dramatic experience of Japanese civilians at the end of World War II when atomic bombings and strategic napalm bombings on all the big industrial Japanese cities killed millions of civilians." Godzilla was not just unusually potent anti-nuclear power propaganda, it was the first major expression in pop culture of the unspeakable tragedy Japan had endured. Watching Godzilla was a mass exercise in catharsis. 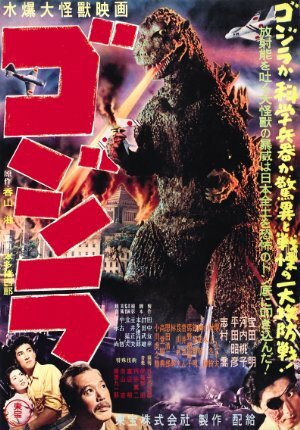 Slant: Stylistically, Godzilla fluctuates between noir-refracted stylization (early scenes, for instance, are heavy on window blind-filtered lighting) and documentary verisimilitude (radio and television broadcasts abound). Honda bides his time, building up a free-floating atmosphere of atomic age anxiety by withholding any glimpse of the Big Bad until 20 minutes in, emphasizing instead the aftermath of Godzilla's destructive path from maritime menace to the scourge of Odo Island, where it promptly takes out the sole survivor of its second ship-sinking, before wading its way into Tokyo Bay. The other narrative strand concerns an eminently conventional love triangle centered on Emiko (Momoko Kôchi), the daughter of renowned archeologist Dr. Yamane (Kurosawa regular Takashi Shimura). In the interests of narrative expediency, Emiko's torn between her newfound crush on Ogata (Akira Takarada), a salvage ship captain, and an arranged marriage with ugly duckling Serizawa (Akihiko Hirata), who just happens to have invented the doomsday weapon that can put an end to Godzilla's reign of terror. It's sad that it wasn't until well into my adult-years that I finally saw the original, non-Burred, Gojira, and, though it was a fuzzy unrestored copy, it was like watching a completely new film. One that still stands superior to the remakes. I really love this film. For me, it's neither sci-fi nor horror, yet both, with a healthy dollop of modern morality play mixed-in. It's unfortunate that it often gets ignored (or even dismissed) by people based on it being "merely" a rubber-monster-suit movie, or because the sfx are so old-fashioned, or even simply because it's b/w.